An abandoned building in the deserted town of Pripyat, 2km from the Chernobyl plant. CAMERA? CHECK. SUNGLASSES? Check. And a Geiger counter? Check. For a growing number of thrillseekers visiting Chernobyl’s radiation-contaminated lands the device is used to help navigate the site of what remains the world’s worst nuclear accident. The uninhabited exclusion zone, a 30km radius around the former nuclear power station, has seen a surge in tourists in the past few years. Almost 50,000 people toured the area last year — a 35% rise on 2016 — to see the plant that contaminated a large swathe of Europe when its fourth reactor exploded on 26 April, 1986. 70% of visitors were foreigners. “(I wanted to) see something totally different,” said Maja Bandic, a Croatian in her 50s, who described the day as “amazing”. These developments were widely covered by international media and alleviated people’s fears over whether it was safe to visit Chernobyl, Kharchenko said, arguing that the risk to tourists is minimal. “A day’s stay in the area equals two hours of flying over the Atlantic Ocean in terms of the dose of radiation absorbed,” he says. But one of the tour group member, Joel Alvaretto, a 28-year-old student from Argentina, confessed he is “a little afraid” of radiation, since he has heard “you can see the effects later, many years after”. Several Ukrainian travel agencies offer tours from one to seven days, priced from €25 to €650. The activities on offer include viewing the new shield covering the damaged reactor, feeding gigantic catfish in the radioactive waters of cooling pools, and driving past the “red forest” – where pine needles turned from green to red after the accident due to absorbing massive levels of radiation. The trees were felled and buried during the clean-up operation, but even now, when a tour bus drives past the area without stopping, the tourists’ Geiger counters all start beeping frenetically, signalling a very strong increase in radiation. “A symphony,” one of the tourists said. Blocks of flats and schools where children’s toys, books and handwritten notes still lie abandoned and a big wheel still rises above an amusement park on the central square. He voices surprise at the luxuriant vegetation, saying he had expected a “concrete jungle”. Nature is reclaiming this abandoned land with tarmacked roads gradually choked by wild grasses and apartment blocks disappearing behind green foliage – a sight that fascinates many visitors. “It proves that nature is stronger than humans after all,” Bandic says. People “have sun, wind, they don’t need nuclear energy: it’s so dangerous,” she concludes. 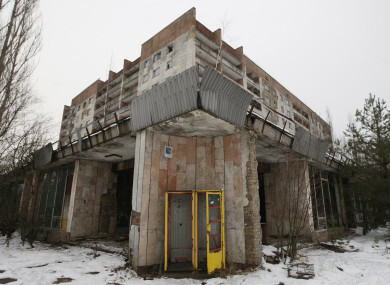 Email “Chernobyl is now a tourist spot for nuclear thrillseekers and business is booming ”. Feedback on “Chernobyl is now a tourist spot for nuclear thrillseekers and business is booming ”.